The flight to Paro is one of the most spectacular mountain flights in the world, with a constantly changing panorama of some of the highest mountains on earth. Our representatives will meet you at Paro airport. After lunch enjoy afternoon sightseeing around Paro, including a visit to the National Museum, Ta Dzong. 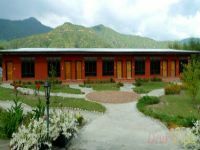 This museum house many religious relics, works of art and handicrafts offering a great orientation into Bhutan’s historical, cultural, and religious past. Next, visit the Rinpung Dzong to see the painting of the great saint Milarepa, considered as the master of meditation by the Bhutanese andbelieved to have attained enlightenment in a lifetime. Dzong’s are large beautiful cantilever wooden bridge still in use. 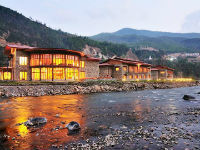 Overnight at your hotel in Paro. 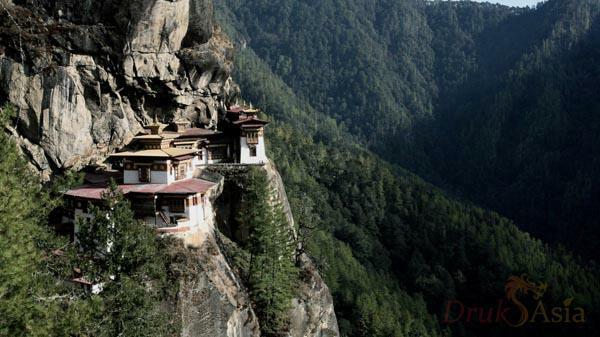 Start your journey in Bhutan with the most interesting and famous destiny to be, the visit to Taktsang. Today we hike up to Taktsang Monastery. “Taktsang” is literarily translated as the “Tiger’s Nest”, and Guru Rinpoche is said to have flown to the site riding on a tigress. He subsequently meditated there for three months. It is one of Bhutan’s most holy sites and draws pilgrims not only from Bhutan but also from neighboring Buddhist countries. 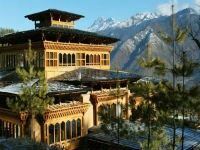 It has a spectacular location on a rocky cliff 900 m above the Paro valley. The famous Tibetan Yogi Mache Lhabdenma attained enlightenment in a nearby spot. The hike starts from the road head about 8 km north of Paro along an unpaved trail, which passes through the farmhouses of Shari. From the parking area at the base of the cliff the trail climbs steeply up the ridge through pines covered with Spanish moss and an occasional grove of fluttering prayer flags. From the top of the ridge, there are excellent views of Drukgyel village with its high school to the south and the army camp above it. It’s a short distance over level ground to the cafeteria at 2,940 m where the monastery first comes into view. The trail to Taktsang itself continues a little further along the ridge, although many visitors return at this point. It is possible to continue for another 45 minutes uphill through the tree until you reach a spectacular lookout at about the same height as the monastery (3,140 m). From this vantage point, Taktsang looks as if it is growing out of the rocks and seems almost close enough to touch, although it is about 150 m away on the other side of a deep chasm. A tough hike if you are not fit and acclimatized but well worth the effort and a highlight of any trip to Bhutan! Dinner and overnight at hotel. (Walking time approximately 3 to 4 hours, depending on fitness). After breakfast, we take up another hike to bumdrak today. Hike from Sangchoekor Buddhist College (2,800 m) to Bumdrak Monastery (3,800 m). It lies far up and beyond Taktsang Monastery (Tigers Nest) you will eventually find Bumdrak located in the mountains overlooking the Paro valley. Reaching this point will give you a huge sense of achievement as you look down at the distance covered. The temple terrace is a beautiful place to enjoy your well-deserved picnic lunch while appreciating the view of the valley and relishing in the feeling of having accomplished the extensive climb. Among a group of prayer flags on the mountaintop, you have views of both side valleys before starting the walk down. The car will be waiting to take you back to the hotel. Bumdrak monastery is another 8th-century temple blessed by Guru Rinpoche. Behind the altar, you can see what is believed to be the footprints of a thousand angels. 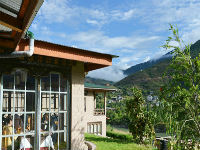 Many monks come to this peaceful place to engage in mediation, dinner and overnight at the hotel, Paro. Right after breakfast we will drive towards Thimphu, the capital city of Bhutan. Upon arrival visit Tashichhoe Dzong, a fortress of the glorious religion. It was built in 1641 by Zhabdrung Ngawang Namgyel and was reconstructed into a present structure by the late King, His Majesty Jigme Dorji Wangchuckin the year 1962-1969. 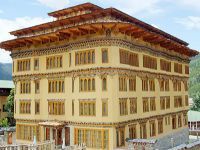 It houses the secretariat building, the throne room and the office of the king, and the central monk body. Visit the National Memorial Chorten (stupa), which was constructed in 1974 as a memorial to the third King of Bhutan, King Jigme Dorji Wangchuck, who is widely regarded as the father of modern Bhutan, The term ‘chorten’ literally means ‘seat of faith’ and Buddhists often call such monuments the ‘Mind of Buddha’. Meet the elderly generation in circumambulation, especially in the evenings, at the National Memorial Chorten. 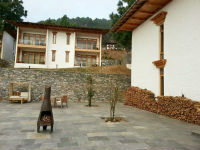 After there you can visit the Institution for Zorig Chusum, commonly known as the Arts and Crafts school or painting school, the institute offers the six-year course on the 13 traditional arts and crafts of Bhutan. Later visit craft Bazaar – A one-stop place to witness Bhutanese culture and buy Bhutan made art and craft product. 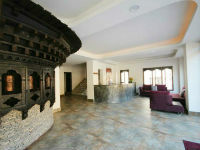 The Bazaar in its 80 stalls covers all aspects of the traditional arts and crafts of Bhutan. At the Bazaar craftsmen and artisans from across the country display and sell their handicrafts. And also, visit other handicraft stores. After lunch your visit would be a leisure one visiting the Zilukha Nunnery, perched on a promontory, overlooking picturesque Trashichhoe Dzong and golf course, it is the only Thang Thong Gyalpo. You may interest here with some of the nuns who have devoted their life to spirituality and Buddhism. Evening at leisure. Dinner and overnight at hotel. Phajoding takes its name from the saint Phajo Drugom Zhigpo, who meditated there in the 13th-century and is considered to be one of the most sacred meditational sites in Bhutan. The monastery itself is an open complex that comprises many holy buildings and relics and a state monastic school that currently houses 40 monks. The trek to Phajoding is an uphill climb through a forested area of blue pine, fire, and spruce. Bhutan is the least deforested country in the world, covered with 70% virgin blue pine forest. The walk, at a leisurely pace, takes about four hours. 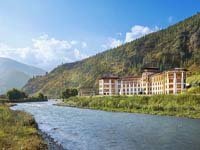 Phajoding provides an excellent view of Thimphu Valley and is also a retreat center for monks and nuns. You can visit some ancient monasteries and commune with the monks. 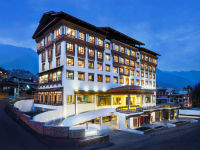 Dinner and overnight at hotel Thimphu. Distance: 4 hours approximately for each, Altitude: 3,500 m, Elevation Gain: 1,000 m, Difficulty Level: Medium. This is one of the most rejuvenating and picturesque hikes in the Thimphu region. It can be done as a loop starting from Dochula and finishing at Hongtsho village with Lungchytse gomba and Trashigang gomba visit. 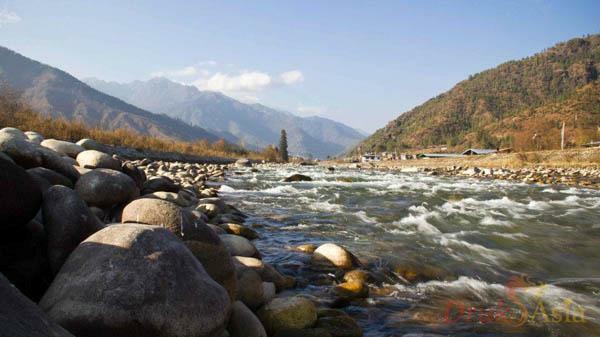 A Lungchutse one can enjoy 360o view of the Himalayan mountain range. You will start your hike from the large chorten in the middle of Dochula, the pass between Thimphu and Punakha at 3,140 m (10,300 feet) above sea level. From here the rail slowly climbs a ridge through a forest of hemlock, birch and rhododendrons until reaching an open meadow. Again, you will enter into a forest of moss-covered rhododendrons, gigantic hemlocks, junipers, and bamboo undergrowth. A small trail leads you the last 50 m past a row of fluttering prayer flags up to Lungchutse temple. On clear days, the view from the temple is fantastic! You will have 360o view of the Himalayas including views of Jumolhari (7,314 m/24,00 feet), Masang Gang in the region of Laya (7,158 m /23,500 feet), Zongophu Gang – a table mountain that dominates the isolated region of Lunana (7,060 m/23,160 feet) and Gangkhar Puensum, the highest peak in Bhutan and the highest unclimbed peak in the world (7,497 m/24,600 feet). You can also see Gasa Dzong, as a tiny white speck in a sea of green almost 50 km to the north. A trail to the left just 150 m below Lungchutse leads to Transhigang village and temple. It slowly descends through spruce, rhododendron, and hemlock and juniper forest. The village’s many dogs will warn the villagers about your arrival as you walk through the settlement down to the temple. It is nice to have lunch around the chorten in the temple’s courtyard while watching the monks in their daily endeavors. The trail leading down from the front of the temple zigzags quite steeply down the side of the mountain until reaching a farm road, which takes you up to the main road. Unless you have had enough hiking for one day, you might also want to visit Hongtsho village temple on the hillside to the right on the opposite side of the road. This involves a 30-60 minute short hike up through the little village and back down again the same way. Trashigang Goemba was built in 1786 by the 12th Je Khenpo. It is an important mediation center, and houses statues of several Je Khenpos who meditated here. Hongtsho Goemba was built in 1525 by the older brother of Drukpa Kuenlay, the Divine Mad Man. It is a two story traditional Bhutanese building where the main later room has an enormous statue of Guru Tashoki Dorji in a standing posture together with a statue of Duru Dorji Drool, Lama Ngawang Chhoegyal, and Lama Drukpa Kuenley. After the beautiful hike walk down to the road where your car will be waiting for you for your next destination to Punakha. Dinner and overnight at a hotel there. This beautiful untouched lake is hidden away in the middle of dense jungle vegetation. 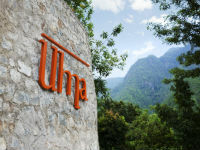 Those who venture on this journey are up for an exciting meeting with overwhelming beautiful nature up close. The hike starts on a red mud path sloping uphill through small villages before reaching the 15th-century temple Chorten Nyeabu. From here, the path follows a man-made creek all the way to the lake. As you proceed upwards, the vegetation gets denser. The mesmerizing sounds created by the many interesting insects are impressively loud and sedative. When reaching the lake, a small path leads down to the water for some magnificent views of Hokatsho in its peaceful and untouched surroundings. Take a few minutes to take in the beauty of the seeing before continuing down again on an alternative path which is not as steep. 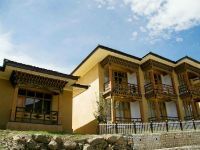 When reaching the village nearby Chorten Nyeabu, we can arrange for you to have your picnic lunch in one of the charming farmhouses scattered on the hillside overlooking the valley. Here you can enjoy the gorgeous views from the family room whilst sipping some ngaja with the locals, before commencing on the last hour down to the pickup point. Upon reaching to your car, drive back to Thimphu. Dinner and overnight there. Time: total 5-6 hours hike. You will drive past by the view of Wangdue town and Dzong (fortress). Before reaching a junction called Lobeysa, take up a short hike to “Temple of Fertility” or “Chimi Lhakhang”. Chimi Lhakhang was built by lama Drukpa Kuenley in 1499. He subdued the demoness of the Dochu La with his ‘Magic Thunderbolt of Wisdom’. A wooden effigy of the Lama’s Thunderbolt in preserved in the Lhakhang and childless women go to the temple to receive Wang (Blessing) from the saint. It is a 20-minute walk across the rice fields from the road at Sopsokha to the temple. The trail leads across rice fields to the tiny settlement of pana. There are very few monks at the temple, which is surrounded by a row of prayer wheels and some very beautiful slate carvins. Walk back to meet your transport and continue to drive towards Thimphu along Dochu la pass where we make a short stop once again to view the Eastern Himalayas. 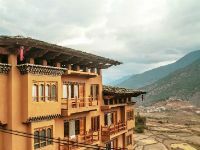 Descend from the pass brings you the village of hongtsho a Tibetan settlement and then onto Thimphu. Lunch in Thimphu and drive in the evening towards Paro. Dinner and overnight at hotel. 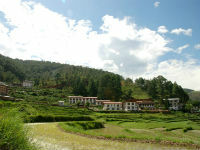 After days of hike take today to relax and enjoy the most scenic places in Paro. The morning after breakfast visits Drukgyal Dzong. With a delightful village nestling at is the foot, was built in 1646 by Zhabdrung Ngawang Namgyal to commemorate his victory over the Tibetan invaders. Historically and strategically this Dzong withstood all its glory and was featured in 1914 National Geographic Magazines. The glory of Drukgyal Dzong remained even when it was destroyed by fire in 1951. Once a clear day one can see the commanding view of the mount. Chomolhari from the village below the Dzong. Later you can visit Kyichu Lhakhang. It is one of the oldest and most sacred shrines of the kingdom dating back to 7th-century (the other is Jambey Lhakhang in Bumthang). The Lhakhang complex is composed of two temples. The first temple was built by Tibetan king, Songtshen Gampo in the 7th-century and in 1968 Her Majesty Ashi Kesang the Queen mother of Bhutan built the second temple in original patterns. After lunch, visit Druk Chodeling, built in 1525, this town temple was formed by Ngawang Chhogyel, one of the prince-abbots of Ralung in Tibet and an ancestor of the shabdrung Ngawang Namgyal. An evening strolls through Paro town. Dinner and overnight at hotel. Breakfast in the hotel, and then drive to the airport for flight to your onward destination. Is this tour suitable year round? You may have to skip Hokotsho Lake hike during the monsoon season since the path would be infested by leech. Other days can be done year round. Just back from Bhutan not Long ago and I enjoy every moment of it. Thumb ups to Mr Sangay for his prompt reply and planning for my trip. And special thanks to my assigned guide Mr Yeshi Dorji and driver Mr. Tshering Wangchuk for taking care of me during the trip. We enjoy each other’s company and share different views on lots of topics. Our 10 day Walking Tour of Bhutan was fantastic! We were so fortunate to have Jambay Dodo and Sangay to accompany us, as guide and driver respectively. They both did an excellent job and were great company. I have written a piece on your Facebook page to commend them, as well as DrukAsia. Overall I really enjoyed my trip to Bhutan. I would especially like to thank my guide Karma Dorji. He has excellent knowledge about Bhutanese culture, history and society in general. He was always in a good mood and was easy to talk to. I would also like to thank my driver for doing an excellent job, despite the difficult road condition there is some room for improvement.